Travel Destinations is always giving away great prizes like overnight hotel visits, dining certificates to outstanding local restaurants, t-shirts, mugs, and more. Enter to win by subscribing to our newsletter or entering our current sweepstakes. Travel-Destinations wants to help you promote your business with an online giveaway or promotion. Get more information, contact us. To enter our latest giveaway find the details below. 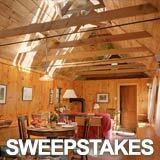 New England Living Magazine is always giving away great prizes. To enter visit our sweepstakes page. We love to giveaway travel prizes, free vacations, products and dining certificates and more. if you would like information about promoting your New England business, website, product or service with a no-charge promotion, contact us. To enter our current free prize giveaway visit our sweepstakes page.